So you’re starting a raffle. A raffle is defined as a type of lottery where people purchase tickets or entries, each with an identifying number. Usually participants buy any number of entries, each with an equal chance of winning. A drawing is then conducted where one or more of these numbers is selected randomly to determine the winner(s). If you’re selling only 200 or so entries, it’s pretty easy to do this with individually numbered lottery balls. Move up to selling 500, 1000 or even 10,000 tickets, using a mechanical ball machine quickly gets a bit unruly to manage. You’ve got to mix all those balls which takes a larger machine. To make the draw , leperfectly credible you need to display those balls before you draw them. So you need to display them in some way so the participants can see that all the numbered balls are actually going to be in the bin to be mixed. Of course, then you need to clean the machine and balls regularly so there is always an equal chance of all balls being drawn. What we might suggest is a multi-chamber machine whereby each chamber is representing thousands, hundreds, tens and ones. As long as you sell an even number of tickets (e.g. 100, 1000, 1300, 1500, 2500, 15000, etc.) 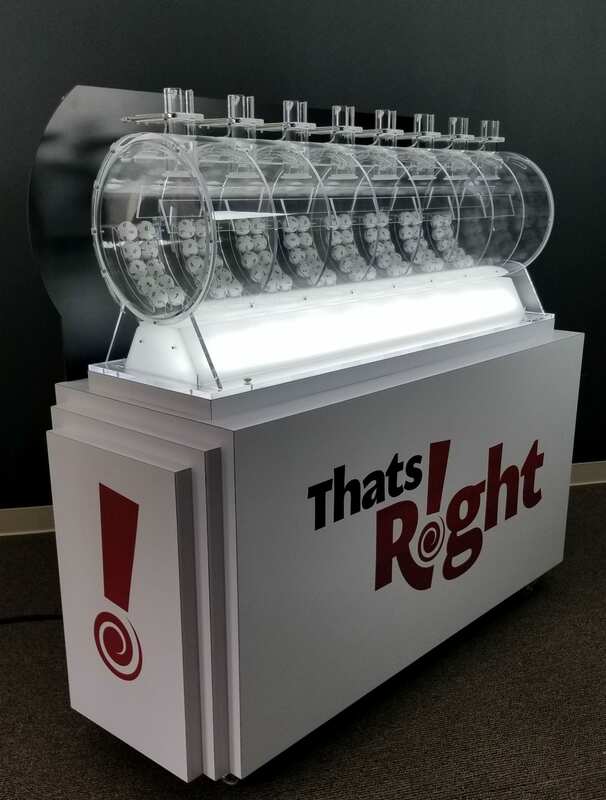 using a multi-chamber lottery machine will greatly simplify your draws. It will save you time, money and headaches and your participants will be able to easily see each ball that will be included in the draw. For example, let’s say that you sell 1000 tickets — you need 1000 balls. Or you can use a three-chamber, single-digit lottery machine where each of the three chambers have balls 0-9 in each chamber. This gives you 1000 combinations 000 through 999. In this scenario 0000 would equal the draw of 1000 or 0000, it just depends on if you sell a ticket with the number 0000 or 1000. This of course works equally well as you move up on quantity. See the example below with a four-chamber machine showing 10,000 combinations. Let’s say you want to sell 1500. You would have 15 in the first chamber (0-14), 10 in the second chamber (0-9) and 10 in the last chamber (0-9). This also works for larger quantities, you just need to add a chamber for each additional digit. 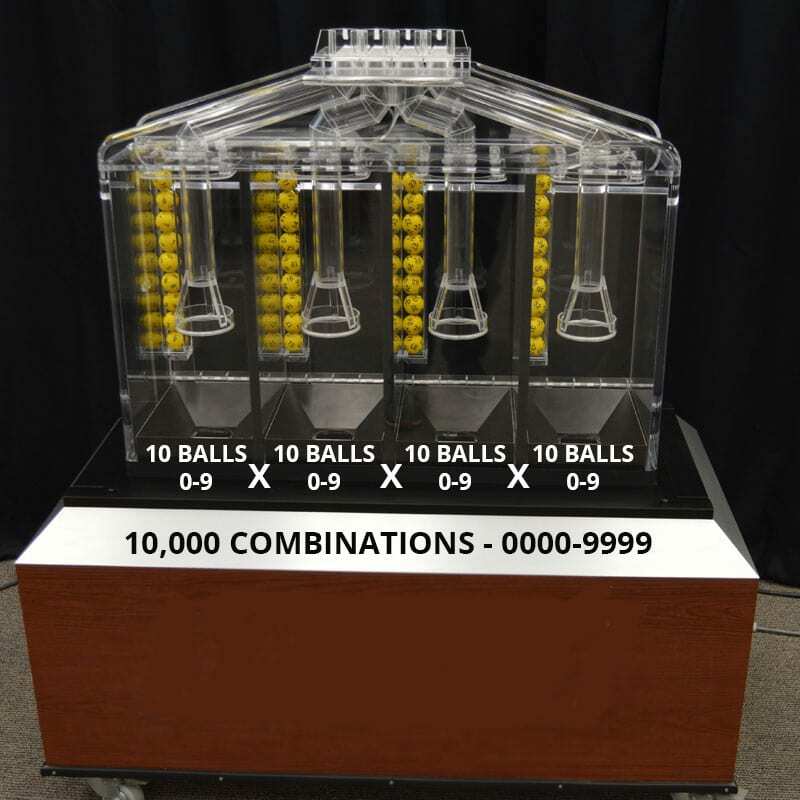 For example, if you want to sell 10,000 tickets, you would need a four-chamber machine with 10 balls in the first chamber (0-11), then 0-9 in chambers 1, 2 and 3. 15,000? Put 15 in the first chamber rather than 10. We had a customer recently purchase an EIGHT chamber machine, giving them 100 million unique combinations if they used 10 balls in each chamber. What if I only sell 1200 tickets and I offered 1500? If you sold UP TO 1200 tickets – -meaning there was no tickets that had been sold that had a number of 1199, then you could reduce the number of balls in the first chamber to 12 and draw accordingly. But if offer 1500 and say, sell 1450, you will need to include all 15 balls in the mix and redraw if you select a winning number out of the range. Simply redraw. Of course it will be very important to explain this to customers BEFORE you conduct the draw. 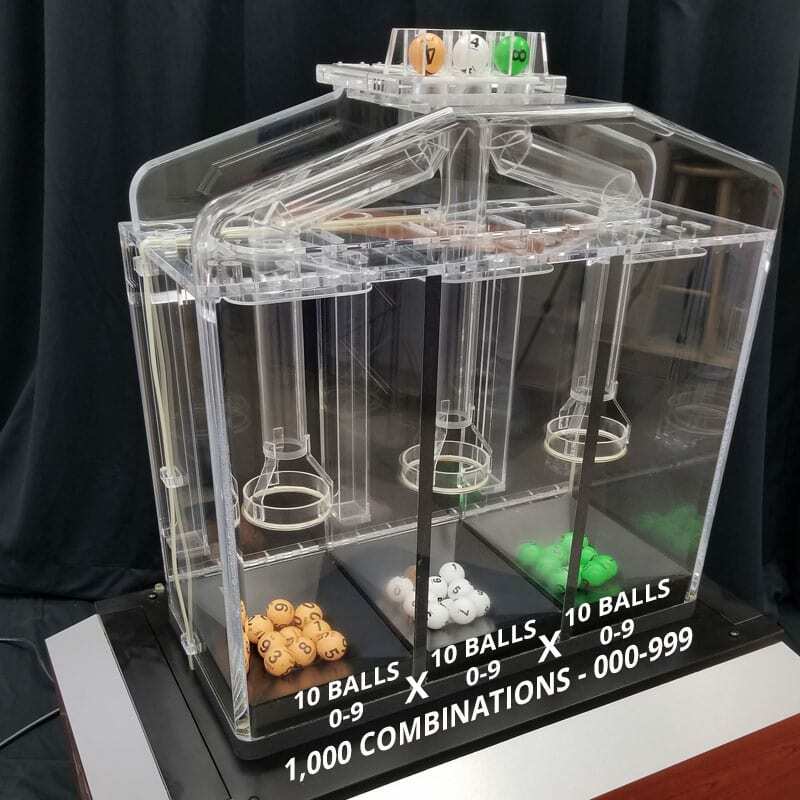 Considering a multi-chamber, single digit drawing machine rather than one large chamber holding 1000, 2500 or more balls, will save you many headaches and allow you to focus on conducting a fair and fun lottery.